For the purpose of these terms and conditions, “You” shall refer to you as client customer and “Outbox4” will refer to APTV Online Ltd T/A Outbox 4 company. using/incorporating licensed imagery sourced by us on your behalf, and/or using/incorporating chosen imagery provided by you. (g) Where Outbox 4 create a website for SEO purposes on behalf of a customer without advance payment or as part of joint venture – the website, it’s structure & content shall remain the property of Outbox4. 2. We may make an extra charge for any additional work required as a result of any change by you to the specification. We will endeavour to agree the extra charge with you, but if agreement cannot be reached, then we may reject the change and adhere to the initial specification. If you are using our Design Service, once you approve our mock up any subsequent changes will incur further charges. 3. If you use the Outbox4 SEO service we will seek to maximise the number of people who find you on the web, at the lowest possible cost to you, but we cannot guarantee any minimum level of income for your business. 4. You shall pay the agreed fee for our Design Service and/or Development before work commences and before your website is installed on your domain name(s) on the internet in the form of a non-refundable initial deposit (any refund applications will be considered on an individual basis). This fee will include our Support Service. Where applicable you shall pay monthly for the service in cleared funds before the end of the previous month. If we agree that you pay monthly by direct debit or standing order for any of our services, you shall pay by the 1st or the 15th day of every month as agreed during the sales process. All prices will be set out in our quotation and are exclusive of VAT which shall be charged in addition. As we offer a payment scheme whereby you pay your initial deposit followed by monthly payments, should you fail to provide direct debit details within 10 working days, we are liable to collect funds from the card initial payment was made for your monthly fees as agreed on your original call. Whereby any standing order/direct debit payment has been defaulted we will deduct your default payment amount from the card used for your initial deposit payment after a period of 14 days whereby we have been unable to collect funds from a second attempt on your direct debit. 5. With our quotation we shall provide you with an estimated date for completion of our Design Service and/or Development Service work. We shall endeavour to do everything within our powers to complete the work by the estimated date and you will promptly provide whatever assistance we may reasonably require to do so. Should you cause progress of the project to extend more than 2 months beyond the expected development time scale, re-negotiation of the agreed price may be necessary. 6. Whether Outbox4 or you the customer provide the text neither shall include any material that is in breach of criminal or civil law and (in particular but without limitation) is obscene, infringes third party intellectual property rights or the Data Protection Act, or is defamatory. Examples of this type of unacceptable material are IRC Bots, Warex sites, pirated software, hate sites and hack programs and archives. We warrant that the Outbox4 Design Service and/or Development/SEO Service work will not be in breach of criminal or civil law and (in particular but without limitation) will not be obscene, infringe third party intellectual property rights or the Data Protection Act, or be defamatory. 7. Any copyright or other intellectual property rights in our Design Service and/or Development Service work (including source code) shall belong to us and you shall have an indefinite royalty free licence to use it for your own purposes only on the domain name(s) specified in your contract with us and artwork for printed items. You shall not disclose any source code whatsoever to any third party (other than to your current service provider subject to the same duty of confidentiality) and shall not use it for any ulterior purpose without our express permission. (a) We cannot guarantee that the website will be totally immune to virus or hacking attacks and we accept no liability for the consequences of such unknown attacks. (b) We accept no liability for any security problems with any web-server nor for any other problem with your website that is beyond our control in any way. 9. In order to support your website both during the debugging period and thereafter you shall allow us access to it at all times and allow us to make any modifications that are deemed necessary for your website to comply with these terms and conditions. (d) Run any gaming servers such as counter-strike, half-life, battlefield1492, etc. 11. You shall not send unsolicited email or spam. 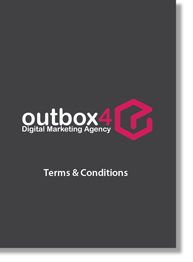 You may only bulk email with the Contract Hosting package and if agreed and arranged by Outbox4 prior to sending. ‘Safe lists’ and ‘double option’ will be treated as spam. 12. We may chose to terminate the website hosting contract and close your website if you are in breach of any of your obligations under Clauses 6 to 10 without paying any refund and you shall reimburse us for any time or expense incurred in cleaning up. 13. We shall not be liable under any circumstances for the consequences of any dealings that you may have in using our Hosting Service with third parties. 14. You shall be obligated to use our Hosting Service at your sole risk and shall be responsible for transfer of files and data and maintenance of all appropriate backups of files and data. 15. You shall provide us with a list of possible domain names, (which shall not be obscene, defamatory, an infringement of any third party intellectual property rights or otherwise unlawful) in order of preference together with our current fee in advance. We may object to any of your names. 16. We shall endeavour to register a chosen domain name for you in accordance with your order of preference with one of our key suppliers and you shall comply with our terms and conditions. 17. Your fee shall only be refundable if we cannot locate any relevant or suitable names. 18. You shall seek a domain name for your own business or personal use and not for the purpose of illegal cyber squatting or any other illegitimate purpose. 19. Your domain name registration shall be valid for a period of two years from first registration and outbox 4 marketing ltd shall continue to renew your registration and charge you unless you give us at least 30 days’ notice before a renewal date that you do not wish to renew. If you wish to cancel within the 2 years you may transfer your domain name for a charge of £50.00. 20. Search Engine Optimisation (SEO) work and Search Engine Marketing (SEM) are activities offered collectively under the SEO label by Outbox4 and each are subject to the individual agreement reached with each client. 21. SEO work is governed by many factors which are outside the direct control of Outbox4 and indeed, any other SEO company. Therefore no reputable SEO company can guarantee particular results. Outbox4 however guarantees improvement provided in a client’s website organic search engine results provided all of Outbox4 advice is followed. Ranking results will be performed once or twice per month, as agreed by both parties. Results are based on listings on Google, Yahoo! and MSN results. 22. Search Engine Optimisation does not include Search Engine submission unless otherwise agreed by Outbox4 and the benefits clearly defined. 24. Your website should be hosted on a reliable server, based in the country of Search Engine interest, with constant availability, for optimum results. Should Outbox4 recommend changing your host or server, this is to protect the interests of your website’s ranking within the Search Engines. Outbox4 cannot be held responsible for slipping or unsatisfactory Search Engine Ranking results if SEO suggestions have not been adhered to. 26. Outbox4 shall not be responsible for URLs dropped or excluded by a search engine for any reason. 27. Outbox4 does not represent or warrant that Customers’ URLs will achieve a favourable position, or any position, within a particular search engine. (b) The customer has not employed the services of any Submission Company during the same period of Outbox4 providing their search engine optimisation services. (c)The customer has not created any duplicate sites, duplicate content or pages, redirects or doorway pages to their website whilst advertising online with Outbox4. (d) The customer has not requested or exchanged links with any link farms or undertaken any spamming techniques which may harm the web sites search engine ranking with Google. (e) The client understands that search engines are independent companies who select and rank sites using their own criteria and therefore to obtain a high ranking the client must follow Outbox4 recommendations for optimising their website for search engine listing. If the client fails to follow Outbox4 recommendations then the results achieved will have considerably less importance than would be achieved otherwise. 29. Please bear in mind, your website’s ranking with a particular Search Term will rely on both the relevancy of that term on your pages, and the popularity of that term on other websites. Both SEO Set Up and Updates will probably require FTP access to the website and its content management system or a contact email address for someone who will upload changes as requested. This may not be necessary for off-page SEO/SEM work. 30. Outbox4 stress that it is not possible to give any guarantees for any specific result on any search engine, nor can we quantify the level of increased traffic or sales, as a result of the search engine optimisation campaign. Advertising online is an unpredictable market place and Chameleon Web Services can give no guaranteed positioning. 31. Outbox4 must have the ability to optimise the structure and content of your web pages. Such changes generally have a minimal visual impact. Outbox4 will work directly with you in order to maintain the original look and feel of your website. 32. Outbox4 cannot take responsibility for any losses incurred by the use of any software created for the client. Whilst every care has been taken to ensure products are problem free and accurate, the ultimate responsibility lies with the client in ensuring that all software is functioning correctly before use. 33. Any scripts, CGI applications or software (unless specifically agreed) written by Outbox4 remain the copyright of Outbox4 and may only be commercially reproduced or resold with the permission of Outbox4. 34. Where applications or sites are developed on servers not recommended by Outbox4, the client is expected to provide or seek any information, additional software, support or co-operation pertaining to the server required in order for the application to be correctly developed. Where large applications are to be developed, it is the client’s responsibility to provide a suitable testing environment which is identical to the final production environment. 35. The client is expected to test fully any application or programming relating to a site developed by Outbox4 before being made generally available for use. Where “bugs”, errors or other issues are found after the site is live, Outbox4 will endeavour (but is not obliged to) to correct these issues to meet the standards of function outlined in the brief. 36. All items purchased through a Storefront or a Roaming Cart will be processed by a third party payment service provider. The payment terms and any fees payable by Shoppers relating to transactions made through a Storefront and/or Roaming Cart will be based on the agreements between the Shopper(s), the Seller(s) and the designated payment service provider. Outbox4 is not a party to any agreement between Seller(s) and Shoppers or Seller(s) and third-party payment service providers. You acknowledge and agree that you (and not Outbox4) are responsible for complying with the terms and conditions governing your relationship with such Shoppers, Sellers and third-party payment service providers. 37. Any User Content, including items that Sellers offer for sale via a Storefront associated with the Sellers’ Accounts, must comply with: (i) these Terms, (ii) any applicable guidelines or additional terms, such as the description of Services for Paid Accounts, and (iii) any applicable policies and procedures enumerated by our third-party partners for use of their website(s). For example, if your Storefront is hosted through your Facebook account, you must comply with Facebook’s terms of service and other rules of conduct, in addition to these Terms and any other applicable Outbox4 terms. use the Application Site, Services or Application for any unlawful purposes or for promotion of illegal activities or products. In addition, Sellers may not offer for sale or sell any items on their Storefronts that are prohibited or restricted by the website on which their Storefront appears. For example, if your Storefront is on Facebook, you must comply with Facebook’s terms of service and rules of conduct. 38. You shall provide us with an email address which is not @ the domain(s) we are providing any of the Outbox4 services on. If you wish to use the email service provided with your account and have an internal mail server, please specify this upon registration with Outbox4. 39. You shall ensure that all text and other company information supplied by you to us is correct and free of typographical errors and we shall not be responsible for checking or correcting it or for the consequences of any error that you may make. 40. You shall indemnify us against all actions, proceedings, liabilities, claims, damages, court costs and expenses in relation to or arising out of any breach by you of these terms and conditions. 41. We shall provide our services with reasonable care and skill and within a reasonable period. In particular, we shall ensure that the appearance and interaction of your website complies with any specification that we have agreed with you. If we fail to do so for whatever reason then (at our option) we shall either rectify any error or refund your fee. We shall not be responsible for the consequences of any event or occurrence outside our reasonable control, nor for any loss of profit or other consequential loss that you may suffer through our fault or negligence or for any other reason whatsoever. We cannot absolutely guarantee to meet any particular deadlines. We cannot guarantee that your website will achieve any particular purpose or generate any business. (A) You have the opportunity to terminate whatever Outbox4 service that you have signed up for at each anniversary of your contract if you provide a letter of termination giving 90 days’ notice to the company by registered post prior to the date of the anniversary of the contract, otherwise the contract will work on a one year rolling basis. Please note, all contracts are verbal and contracts cannot be cancelled out with your 14 day statutory cooling off period governed by Scottish Law. (B) If you want to cancel out with these terms, a cancellation fee will apply. Please note the cancellation fee will be calculated based on the reminder of the outstanding monthly fee. (D) If you use your right to cancel at any time the Intellectual Property will remain the property of Outbox4 and will only be released to you upon payment in clear funds of £199.00 plus VAT if applicable. On receipt of those funds your website will be delivered to you via email. 43. Both parties shall keep confidential and not use for any ulterior purpose any confidential information that we may acquire about the other’s business as a result of any work that we do for you. 44. You shall not attempt to employ or engage directly any of our employees or consultants who help to provide our services to you for a period of 3 years after their work is completed. 45. We may chose to suspend or terminate our services if payments are late without prejudice to any claim that we may have against you for breach of contract. Any payment that is due but unpaid shall bear interest at a rate of 5% per month from the due date until the date of payment. Payment shall be paid by Direct Debit only on the first or the fifteen of each month. If payment is not received by us on these dates, we may suspend the account. If any payment for any of our services is more than 29 days overdue then (without prejudice to any other rights we may have) we may suspend or close your website. 46. These terms and conditions shall apply to all contracts between both parties to the exclusion of any other conditions. Each of these terms and conditions and each part thereof is separate and severable from any other term and condition or part thereof and any invalidity, illegality or unenforceability of any term or condition or part thereof shall not impair the enforceability of any other term or condition or part thereof. 47. These particular conditions are exhaustive and exclude all other representations or warranties, express or implied by statute or common law. 48. We may change the basis of these terms and conditions if change is necessary in the interest of good business practice, but no such change shall affect the nature and quality of the service provided by us. 49. All notices from you to us shall be in writing and sent by registered post or fax to the address given above and shall be deemed to have arrived 48 hours after posting or immediately after transmission by fax. 50. These terms and conditions are governed by Scottish law and subject to the exclusive jurisdiction of the Scottish Courts. Find out how we can help your business grow online.